Warm cinnamon-scented carbs… is there anything better? I finally got back into the kitchen this week and baked up a recipe for my friends at Peanut Butter & Co. 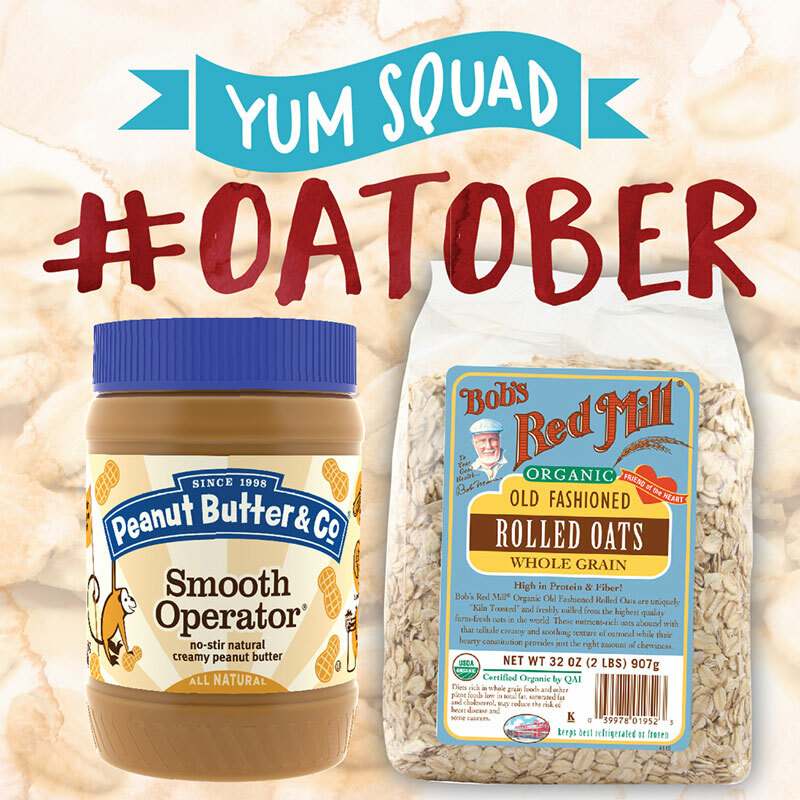 This time, they challenged Yum Squad members to see what we could come up with given any two jars of their peanut butter and a bag of Bob’s Red Mill old-fashioned oats. Two of my favorite things. My first instinct was a cookie, but I made a pledge to overcome my fear of killing yeast doughs by facing them head-on, so I tackled a sticky, yummy yeast bread with a cinnamon raisin peanut butter swirl. I decided to use oatmeal in the dough, so I started by heating milk, water, salt, honey, butter and oats on the stove. The oats are not really cooked, just softened. Once the milk & oats mixture was cooled, I added the yeast and let it sit until it was foamy and fragrant. When yeast blooms, it is fabulous to see and smell. 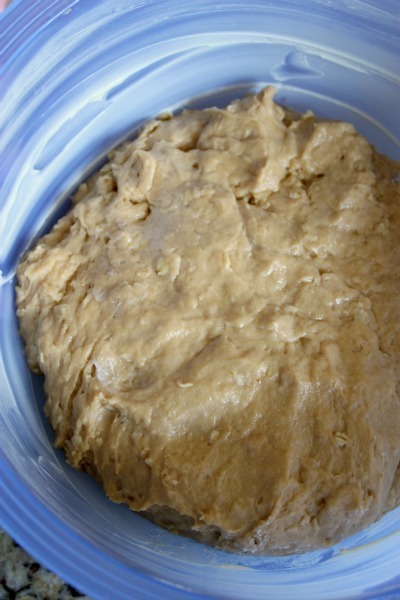 Once we had a full-blown yeast party, I blended in the eggs and added bread flour with a secret twist – Peanut Butter & Co. powdered peanut butter. I used their chocolate version. If you’ve ever wondered if you can toss powdered peanut butter into baked goods, the answer is yes! Just 3 tablespoons sifted into the flour added the perfect hint of peanut butter flavor to compliment the filling. Do you have to use it? No. But if you can, do. Once the dough was mixed, I covered it in plastic wrap and a towel and let it nap in a sunny window. 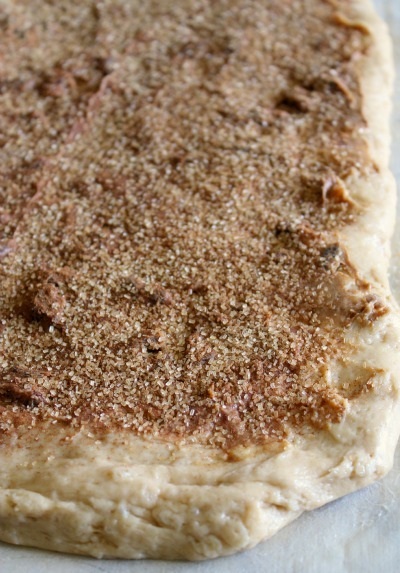 When it was doubled in bulk, I divided the dough into two equal rectangles, smeared half a jar of cinnamon raisin swirl peanut butter over each, sprinkled them generously with a raw sugar and ground cinnamon mixture and rolled them cinnamon roll style. Look at that gorgeous cinnamon raisin swirl peanut butter layer. I could almost eat it just like this. Next, sprinkle with raw sugar and cinnamon. Instead of individual rolls, I dropped them into buttered loaf pans and let them rise again. All I could think was “slice it, butter it, and toast it on a griddle” so I went with loaves. Two gorgeous, pillowy loaves. I wish you could smell them. Finally, just before I popped them in the oven, I rubbed on a little softened butter, sprinkled on some additional oats (oh, how I love these oats!) and finished with a drizzle of local honey. Just because. Now, I know what you’re thinking. ‘Yeast breads are hard. Yeast is too easy to kill. Yeast bread recipes take too long to make.’ I feel ya’ and I was with you until very recently. The truth is, yeast breads DO take longer to make due to all that rising, but don’t be fooled – they are EASY to make. I swear it. 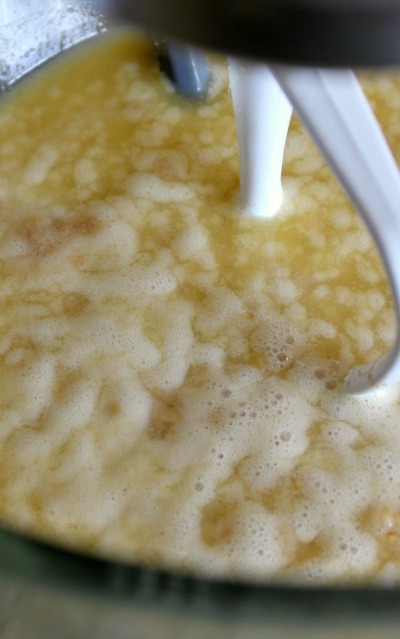 In a small saucepan, combine the milk, water, salt, honey & raw sugar. Cook over medium-low heat, stirring often to keep the honey from burning, until the mixture begins to bubble and foam around the edges. 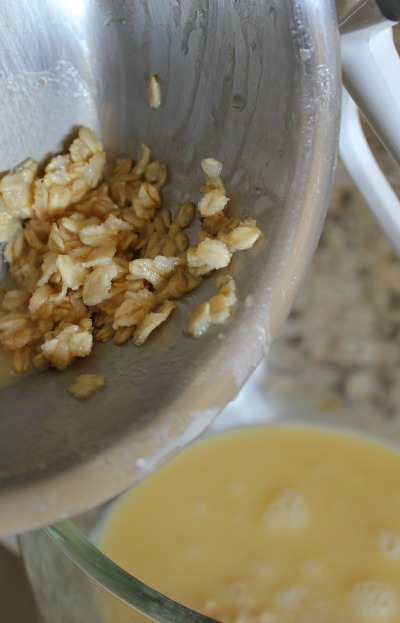 Add the old-fashioned oats and continue to cook for 2-3 minutes. Give them a stir, remove from the heat, and add the stick of butter. Allow this mixture to cool to 110F. While the liquids are cooling, sift two cups of flour with the peanut butter powder and set it aside. Measure an additional 2 1/2 cups of flour and have it standing by. 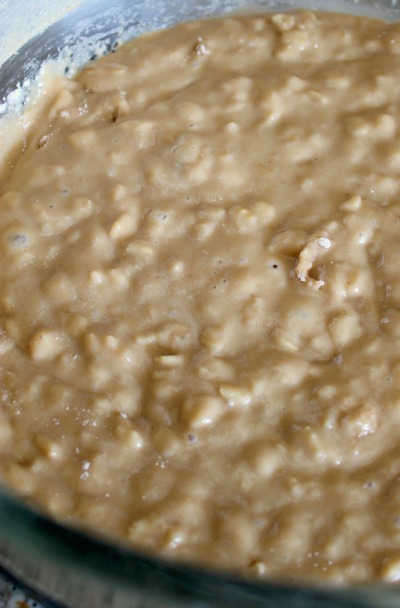 When the milk and oat mixture is cooled to 110F, add the yeast and allow it to sit for at least 10-15 minutes, or until the mixture is bubbly and frothy. With your paddle attachment on and your mixer at low speed, blend in all four eggs. Start adding the flour with the powdered peanut butter first, about 1/2 cup at a time, until almost blended. Switch to the bread hook attachment and start adding additional flour until the dough is thick but not dry and tries to climb over the top of your dough hook. I used 4 1/2 cups total, but you may need more or less. 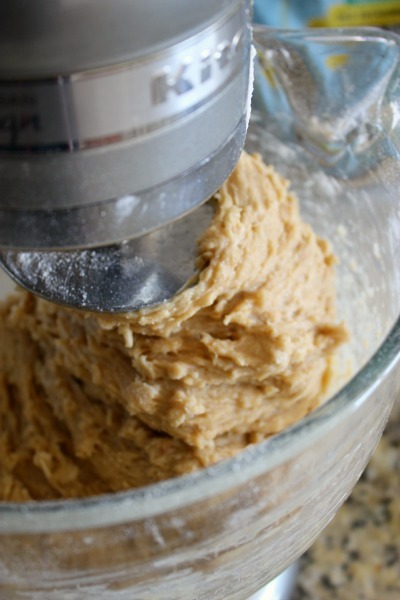 Once blended, stop the mixer and scrape down the sides of the mixer and dough hook. Place the dough in a buttered or oiled bowl, cover with plastic wrap and a kitchen towel, and set it in a sunny window to rise. 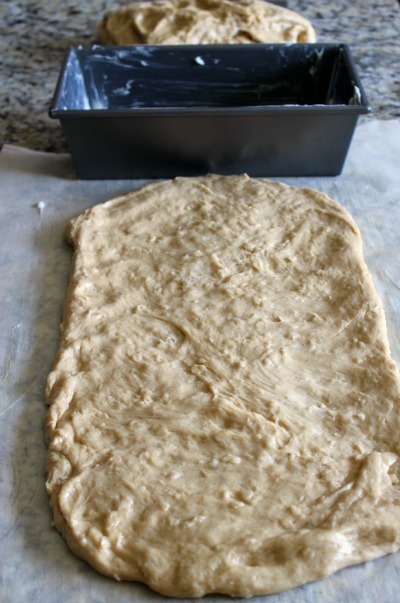 When doubled in bulk, divide the dough into two equal portions. 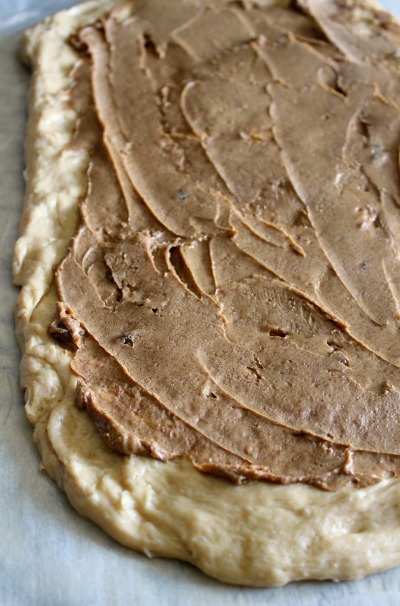 On a piece of buttered parchment paper, shape each half of the dough into a rectangle as wide as your loaf pan. Spread on half the jar of peanut butter, working it out close to the edges. 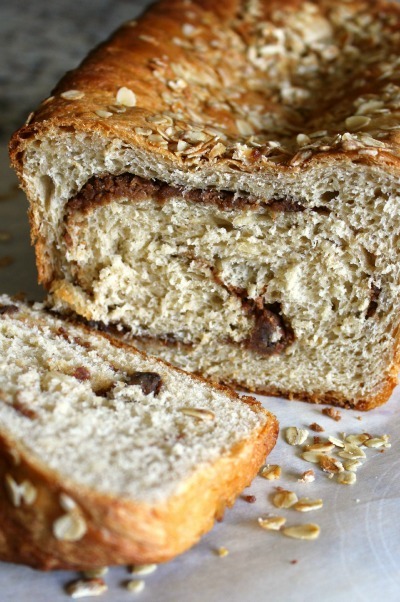 Sprinkle with half the raw sugar & cinnamon mixture, then roll like a jelly roll and place into your buttered loaf pans. Cover with plastic wrap and allow them to rise until doubled again. Pre-heat your oven to 350F. 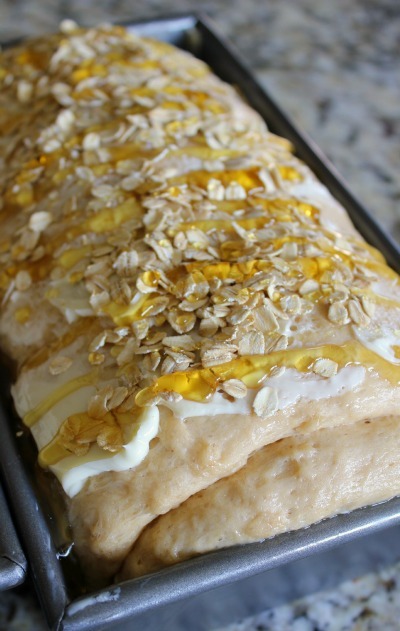 Rub the top of each loaf with softened butter, then sprinkle with oats and drizzle with honey. Place the loaf pans on a parchment-covered baking sheet (in case of spillage during baking) and bake for 15 minutes uncovered. After 15 minutes, tent the loaves with foil and bake an additional 15-20 minutes, or until the loaves are risen, browned and make a hollow thump noise when you tap them. Remove from the oven and cool in the pans for 20 minutes, then turn out onto cooling racks to finish cooling (at least one hour). I’m embarrassed to admit I avoided yeast dough for too long. So if you like hot buttered carbs as much as I love hot buttered carbs, promise you’ll tackle a yeast bread soon. Today, maybe. You can do it. I believe in you. Note: As a member of the Peanut Butter & Co Yum Squad, I am occasionally given jars of peanut butter (and sometimes additional products like the Bob’s Red Mill old-fashioned oats in this recipe) to play with. What I choose to do with them is up to me. I am not compensated for the recipes or the posts. If I like it, I share it. It’s just that simple. That looks delicious! Where is the Smell-O-Vision?!? I wish! If Smell-O-Vision was pay-per-view, I’d be rich. RICH! 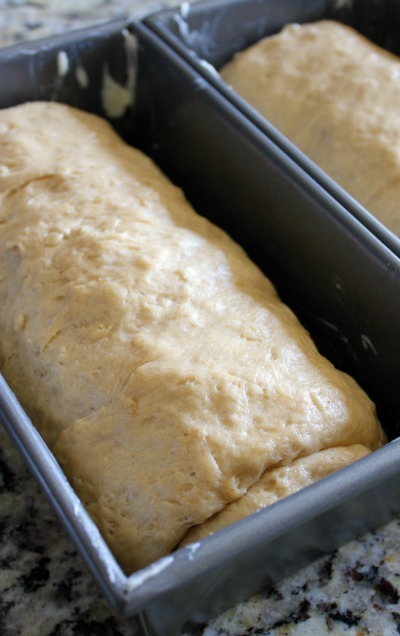 Yeast breads are easy and awesome to make- and yours looks like it turned out GREAT. I love the addition of oats here, great job! I didn’t even know powdered PB was a thing. I want to face plant into a thick slice of this. Oh it’s totally a thing and you need it, Amy. I’m going to use it in a chocolate PB malt next. I really miss your posts – I hope you continue to be inspired. I wish you were still close enough to help me eat this! Hugs to you & Carl. Missing you, too! Hi Jeanne, I just love this recipe. I could see me making a fat piece of toast out of this bread – double yum! Your instincts are spot on. 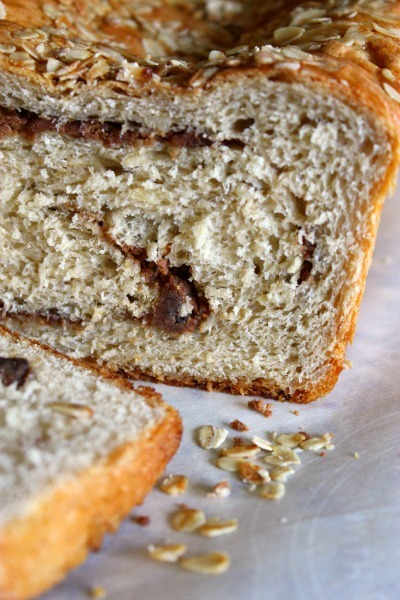 This bread is delicious buttered and toasted in a skillet. We just had it for breakfast this week.